REMEMBER TO INCLUDE YOUR WAIST MEASUREMENT WHEN ORDERING. This listing is for a universal handmade leather sword belt that can be integrated onto a scabbard of your choosing. This is the "fanciest" of the integrated swordbelts that we offer. The weave is a bit more complicated than our other styles, but the included instructions make it simple enough. This style features 4 parts, 1 woven piece with the main belt buckle, 2 smaller straps with buckles that are woven onto the scabbard in knotwork pattern, and the main belt end which connects to the 2 buckles on the small straps. You have the option of a double or single belt rig. The single belt rig will include only the integrated belt, the double will include a second, thinner belt that connects to the integrated belt on the opposite side of your body, and aids in weight distribution. Both belts are made of 8-10 ounce latigo cowhide, unless the "natural" color option is chosen, in which case it will be made out of vegetable tanned leather. 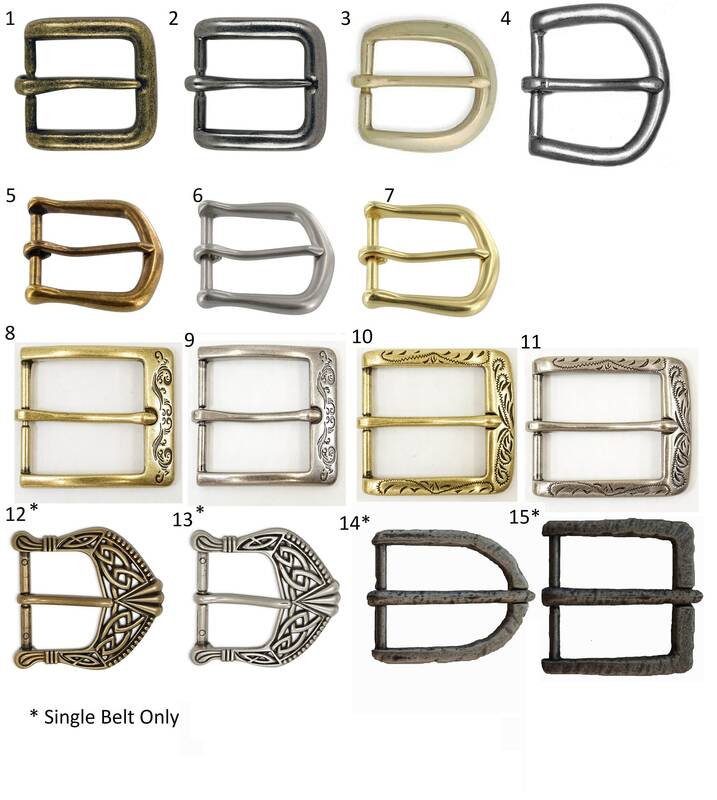 You now have several different options for buckles. Check out the last image for reference. be advised that buckles 12 and 13 are only available in single swordbelts, as a matching smaller buckle is not available. Each integrated portion of the belt is made "one size fits most" and includes instructions on how to weave the belt onto your scabbard. 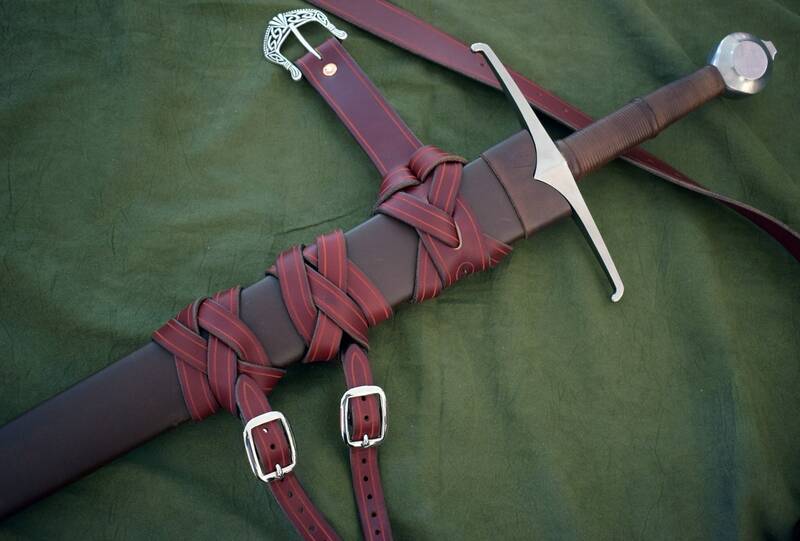 For customization, or if you'd like to send me your scabbard for a more exact belt fitting, feel free to message me. 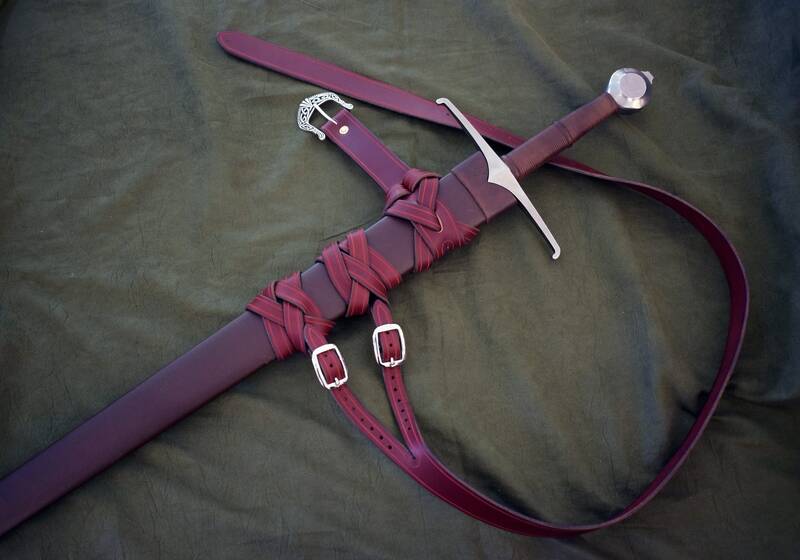 As per usual, this listing is for the belt only, the scabbards and swords are not included. Got it. Love it. It was like a little puzzle to make the knots look right. But I got it first try (astounded). Perfect match to my sword scabbard color. I wanted a contrast, and the belt is much darker, but the belt edging is an exact color match to the lighter scabbard. Weird coincidence , but makes it look like it was made together.